A short, but busy week in Grade 1! The students thoroughly enjoyed engaging in all the International week activities! In Literacy, students branched out from having discussions about story elements (characters, setting, plot, ending) to writing their own stories. International week served as great inspiration for many of our student authors! Next week, we will focus on the editing and revision process. In Math, we continued to investigate 2-D and 3-D shapes. Students were focussing on “shape language” this week, which as explored by playing games. One such game involved a partner choosing a mystery shape and giving clues (“I’m holding a shape with 6 faces. It has 8 vertices. It has 12 edges. What shape do I have?”). In Music, the Grade 1s listed people that they find in their community. Next week, they are going to write poems about them and set them to music. One part of community is dance and the students have really come together to learn partner and group moves to I’s the B’y. This week in Art, students finished their stained glass windows. They are filled with shape, line, and lots of colour! In French, the students finished their marionnettes (puppets), that they will be using to practice our play, Le petit chat cherche une famille. This week in PHE, the Grade 1s began a dance unit with Megan Nadain. They are working on everyday movement creating links with partners by putting different body parts together. 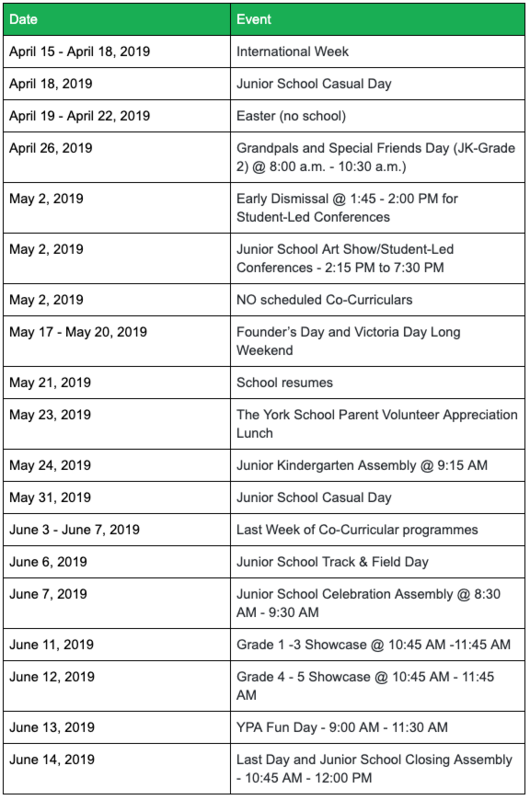 A gentle reminder that all student absences should be emailed to 1639attendance@yorkschool.com. This week, we worked diligently preparing for our upcoming Job Fair. The students have spent much of their time researching their chosen profession and are eagerly awaiting their opportunity to show what they know! If you could talk to your child about possible costume options, that would be much appreciated. On April 25th, your child can come to school dressed with their career costume over their school uniform. On April 26th at the Grandpal’s Day assembly, the students will be reciting a poem called Families. We have attached a copy of the poem. If you would like to practice with your child at home, that would be much appreciated! The poem can be accessed here.